Registration for the 2019-2020 season will open on Mar. 1, 2019. C.D.M.H.A. uses On-Line registration only. After this time in order to participate in the try-outs you must still register your child on line and pay the $75.00 (Cash) walk up try-out fee. LATE FEE: If registering after Aug. 15, 2019 each registrant (Player) will be charged a $100.00 late fee. Exempt from the late fee are Discovery,Initiation, Minor Novice (Previously Tyke) players and first time registrants of C.D.M.H.A. New to our Association or have a first time player(s) to sign up...Please contact our Registrar, Michael Kichinko. First time players are required to provide proof of age (birth certificate, passport). In the case of those moving into town after having played minor hockey elsewhere you will be required to provide proof of residency to the OMHA. CLICK HERE to go to the C.D.M.H.A On-Line Registration System. INSTALLMENT PLAN DATES: After $100.00 per player Deposit. The dates are June 1st, July 1st and Aug. 1st, 2019. If you register after June 1st, 2019 you are ineligible for the installment plan. LATE FEE: If registering after Aug. 15, 2019 each registrant (Player) will be charged a $100.00 late fee. Exempt from the late fee are Discovery, Initiation, Minor Novice (Previously Tyke) players and first time registrants of C.D.M.H.A. REP/AE TRY-OUT INFO: $50.00 for 4 hour try-out per player, minimum 2 hour rep try-out and 2 hour AE tryout. Only players that have signed up using the on-line system are eligible to participant in try-outs. If you registered your child for local league and he/she have changed their mind and wants to try-out, the Walk-up Rep try-out fee is $75.00...Cash Only. Players withdrawing from C.D.M.H.A. prior to September 1st will receive a full refund of any money paid minus $50.00 non-refundable deposit. This will be the seventh year CDMHA utilizes online registration with Hockey Canada. If you have never registered online with Hockey Canada you will create an account by clicking on the "Online Registration" link and then on the homepage of the registration site choose; "If you have not registered any participants in the past with this system, you must create an account". Your email address and a password is all that is needed to create your account. Then just choose the player you are registering if they have been with CDMHA in the past as they will exist in the system. The Hockey Canada ID is not required. The account is a family account; you only need one account to register as many family members as you wish. Just add registrants to your cart before checking out. If you have utilized Hockey Canada's online registration in the past you may use the same account to register but you must use the Hockey Canada link above which is specific to CDMHA. If the player being registered still exists in a different association, an error message will occur. If this happens contact the CDMHA Registrar Michael Kichinko and a transfer will be initiated. If you forgot your password please use the Password Recovery feature on the login page to recover it. All 3, 4, 5 and 6 year old players (2013, 2014, 2015 and 2016) must register at the discovery/initiation level. Based on evaluations, some players may be moved up to the Minor Novice program. In the event a player is moved up from Initiation to Minor Novice, the difference in registration fees will be required to be paid to CDMHA. All 7 year old players (2012) must register at the Minor Novice level. Based on evaluations, some players may be moved down to the Initiation program...In the event a player is moved down from Minor Novice (Previously Tyke) to Initiation, the difference in registration fees will be refunded by CDMHA. 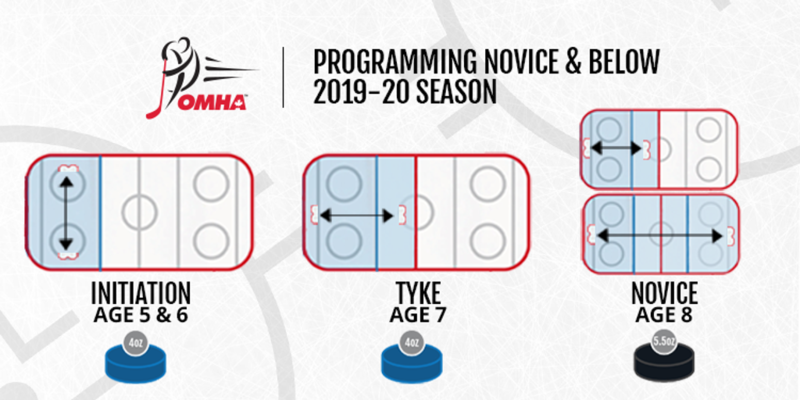 Starting in the 2019-2020 season, Hockey Canada has mandated players 8-years-old and under will participate in modified-ice games, which includes cross-ice or half-ice. 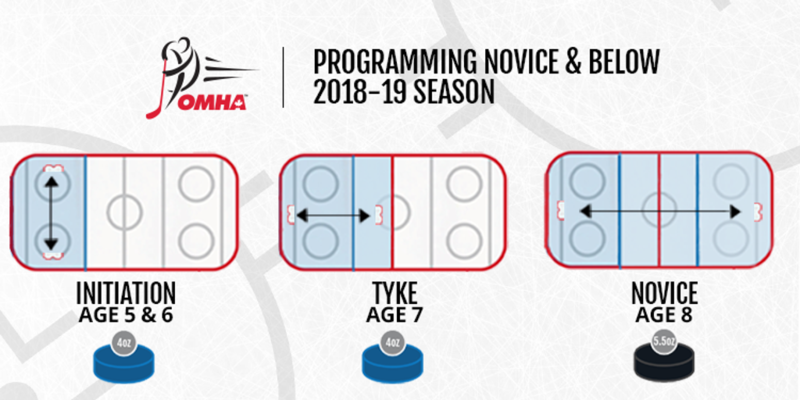 To continue the player progression for young athletes already in modified-ice programming, the OHF will expand its modified-ice programming in 2018-2019 season and advance 2011-born players from cross-ice to half-ice games. The focus in practices will remain station-based. In 2019-2020, as per the Hockey Canada modified-ice mandate, those same players start the season playing half-ice games and end it with full-ice games. In conjunction with its Members, the OHF is in the process of producing materials to support minor hockey associations and clubs as they work through this change. The Ontario Minor Hockey Association continues to work closely with our associations and our partners in hockey to deliver resources and best practices for coaches and administrators to create the best possible programming at this pivotal stage in the player development pathway. PLEASE DO NOT SLIDE CHEQUES AND FORMS UNDER MINOR HOCKEY OFFICE DOOR.